Home-grown and freshly prepared – the rice, vegetables and fruits served with your meals at Jetwing Kurulubedda are all cultivated from the paddy fields and gardens that surround you. As you dine in seclusion amidst one of the many homes of Sri Lankan hospitality, our resident chef will be happy to serve you with favourites from the east or west, or better yet – authentic local specialties from southern Sri Lankan village cooking. No matter the flavours your tastebuds desire, we are happy to serve you from the comfort of our restaurant, or with three Signature Dining options to experience the best of our home environment. Our open-air restaurant is found by the edge of the pool, and sits upon a raised wooden deck that extends into a walkway winding through the surrounding foliage. Shaded by the towering trees outside, or by a village hay roof indoors, we recommend savouring our crispy pol rotti and freshly ground chilli sambol with a cold juice made from the fruits of our garden. The experience is especially pleasing during breakfast hours – an enchanting time of the day, when you will be accompanied by the occasional fleeting squirrel and the calls of our resident birdlife. For a distinct dining experience at Jetwing Kurulubedda, our Signature Dining experiences are a timeless specialty celebrated across our many homes of Sri Lankan hospitality. Here at our serene sanctuary in the south, you have the freedom to dine amidst our welcoming greenery – by the deck of our pool, the terrace of your room, or even in the tranquility of our garden. The menu is yours to decide, as is the time and place. 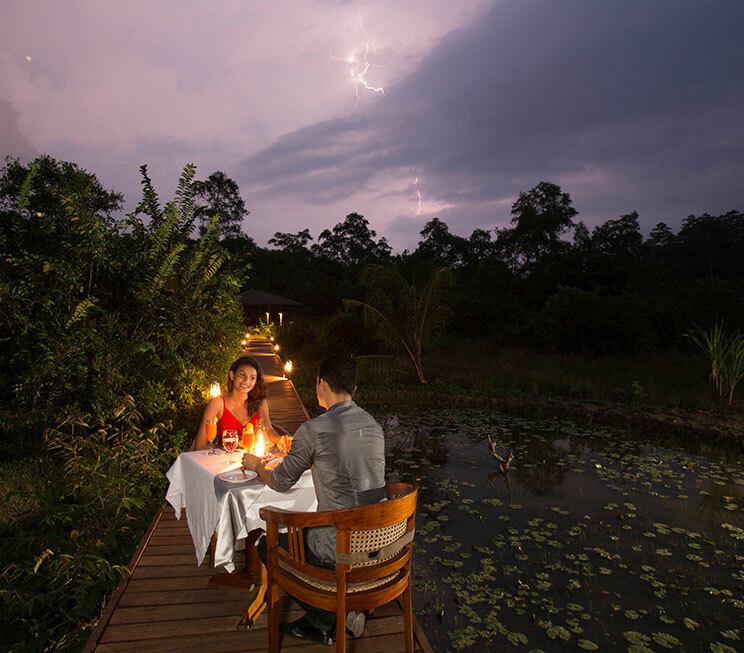 Whether you prefer the morning light creeping through the jungle foliage or the beauty of our starlit southern skies, we look forward to treating you to a culinary experience like no other.